Modern Gold Pink Geometric Bridal Shower Invite. These greenery foliage invites will do the trick! 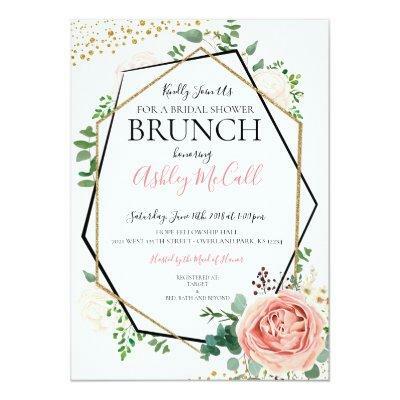 this customizable invite features a modern geometric frame with faux gold glitter and black. The borders are adorned with green foliage such as eucalyptus, berries and pink and cream roses flowers. The sides are adorned with faux gold glitter. This makes a great modern foliage invite. Find other wood wedding invitations at Just hit the "customize it" button for further customization.